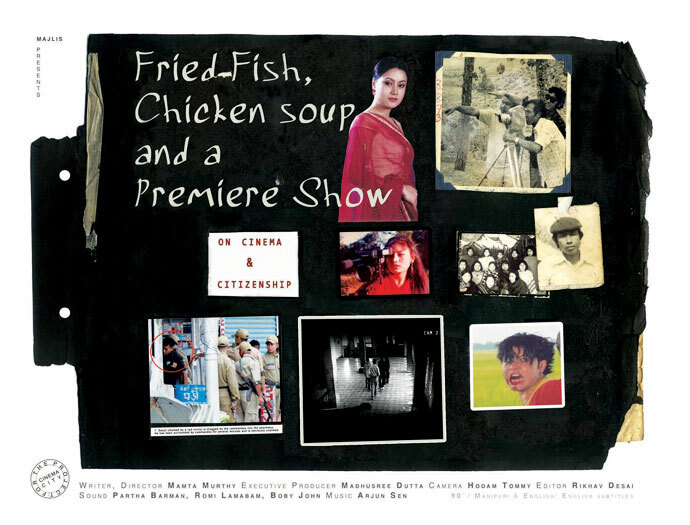 A poster for "Fried Fish, Chicken Soup and a Premiere Show"
Fried Fish, Chicken Soup and a Premiere Show, a 90min documentary film dealing with the alternative cinema tradition in Manipur wins "Best Documentary" at 6th Signs National Film Festival 2012, Kerala held from February 17-21. The festival is conducted by the Kerala region of the Federation of Film Societies of India.. The film is directed by Mumbai based International award winning filmmaker Mamta Murthy. This announcement was posted on February 21, 2012.